Then you fold it into a triangle. This napkin wasn't completely square but you want to get it as close as you can to a triangle. Then you want to start rolling the napkin from the bottom of the triangle up. Stop rolling about right here and flip the napkin over. Flip it over and there you go!! It seems like a lot of steps but once you get the hang of it, they are a lot of fun to do!! I love the little touches you can do in decorating a table! 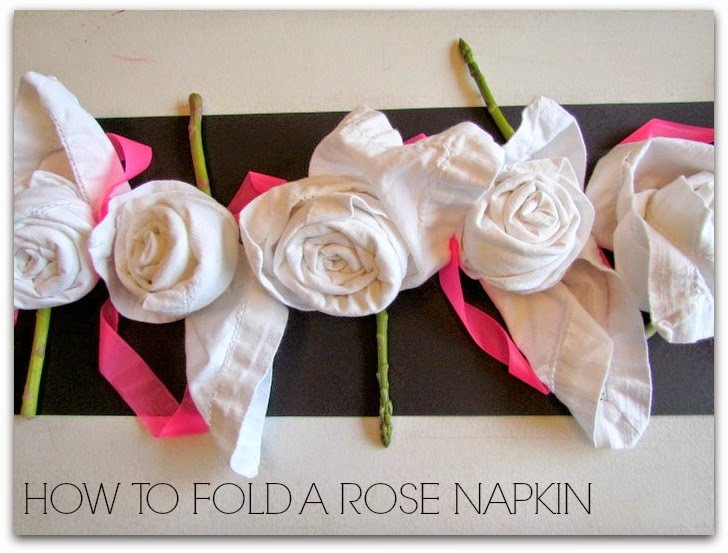 These roses are an inexpensive way to make a table special for any occasion or just dinner! Enjoy! Are you getting ready for Easter? I'm so behind, I typically have outfits bought for the boys and everything ready! One thing I did was make was some Easter baskets. It's going to be a busy week but I hope to share with you their baskets. And if I have time I want to give you a peak into the boys room too! More to come of this Little House of mine!